Young women today have more options than ever before. Don’t get stuck having to make a decision to go one way or the other. You can have it all by joining our top of the line infertility treatment center! Not ready to have a baby right now because you are focused on your career or haven’t found the perfect match? Egg freezing may be the right choice for you! FACT: A woman’s fertility begins to drop in her late 20s or early 30s and falls more rapidly after the age of 35. Egg freezing is an effective way to preserve your fertility, giving you the best chances of being able to successfully get pregnant later in life. SOLUTION: IVF Phoenix™ was one of the first infertility clinics in the United States to implement the egg vitrification (flash freeze) process and demonstrate high survival and success rates. Dr. Couvaras and his team of specialists have continued to help women achieve their dream of having a baby through our egg vitrification program since 2010. Should You Consider Freezing Your Eggs for Fertility Preservation? Fertility Preservation is a new way of empowering reproductive choice. Reproductive choice means having children when you prefer, rather than when you must. The fertility of youth is no longer a limited resource, constrained by age. The concept of“fertility preservation” offers hope to women who previously had limited or no options for the future creation of a family Women can potentially pursue their reproductive lives at their own pace, rather than according to the obligations of biology. Oocyte cryopreservation, or egg freezing, is a relatively new procedure in the field of assisted reproductive technologies. At IVF Phoenix™ our Embryologists have been trained by an experienced Cryobiologist who has had success in not just freezing and but in the step that really matters: thawing viable eggs and embryos. Eggs can be frozen but you need to be assured your fertility center of choice knows the complexities of thawing. Historically, egg freezing has been utilized for young women who are facing cancer treatments such as chemotherapy or radiation, who wish to freeze eggs as their egg supply is destroyed by cancer therapies. Since the advent of better freezing techniques (i.e. vitrification) and media beginning in 2007, egg freezing has now become a more popular treatment offered at a limited number of fertility clinics for both cancer patients and for women who are concerned with their advancing reproductive age, but not in a position to have children yet. Even fewer fertility clinics have an experienced Cryobiologst on their team to conduct the latest proven methods of vitrification. IVF Phoenix™ is proud to extend this expertise to you. Currently, IVF Phoenix™ has shipped frozen eggs and embryos to Canada, the UK, and Australia with success at thaw. HAVE YOU TESTED YOUR FERTILITY POTENTIAL? Ovarian reserve describes the number of eggs that remain in the ovary. The greater the number of eggs, the better the chance that some are healthy. Medical tests can help predict ovarian reserve. Fertility Preservation or egg freezing incorporates existing fertility therapies. Survival of the egg can be variable but has been reported as high as 90% based in numerous studies. Recent data suggest that optimal success rates per cycle range from 30-40% range or higher per embryo transfer. The maximum age of 38 has been set because current scientific data supports the notion that the egg that is vitrified and subsequently warmed has the best odds of surviving if retrieved and frozen prior to age 39. As the techniques and technology improve over time, this age limit may change. Therefore, if fertility preservation is the goal, the survivability and potential success of the egg once it is warmed must be considered prior to its freezing. IVF Phoenix™ is a leading fertility medical practice. All physicians are board certified by the American Board of Obstetrics and Gynecology in Reproductive Endocrinology and Infertility and are members of the Society of Reproductive Endocrinology and Infertility (SREI), and the American Society of Reproductive Medicine (ASRM). Dr. John Couvaras has more than 20 years of successful clinical, academic, and scientific experience. Our Lab is operated by one of the most experienced Embryologist in the nation, Anne Buchanan. Oocyte cryopreservation is an experimental procedure. Data relating to clinical outcomes are limited. Oocyte cryopreservation is not an established medical treatment. Before undergoing the procedure women should be informed fully about the process involved and the clinical outcomes that reasonably can be expected so that they can make a truly informed decision and give valid consent. Counseling by a qualified mental health professional is recommended. 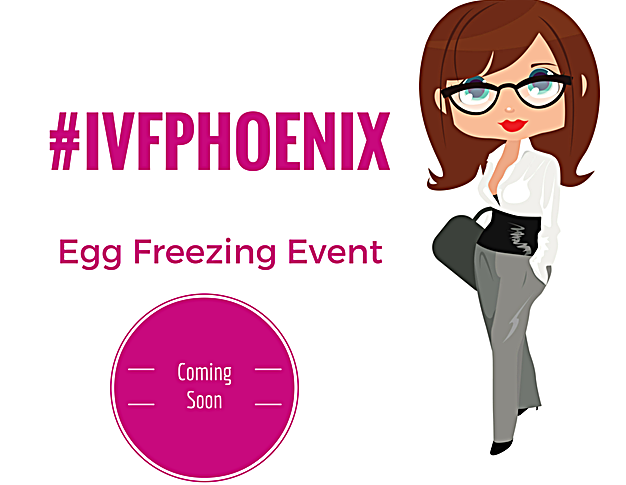 At IVF Phoenix™ we typically freeze embryos one, three or five days after an egg retrieval procedure. The day we freeze embryos depends on the individual circumstances of a particular patient, how well embryos are developing in the laboratory, how many embryos we have, and when a patient is having her embryo transfer. Most patients have a transfer on the third day after retrieval and we freeze surplus healthy embryos, called MII’s the same day. At this time, we can see how well the embryos are developing and choose the best embryos for transfer and freezing. Embryos tolerate freezing relatively well on day 3 and about one-third of patients become pregnant after a transfer using thawed embryos. It is not common to freeze embryos on day 1 after retrieval since at this time we have very limited information on their development, but this is the stage at which embryos best tolerate freezing and thawing. In 2005, 92% of embryos thawed at this stage survived, compared to 64% of embryos surviving after freezing on day 3. However, the lack of embryo development information on day 1 means that we are probably freezing many embryos that have little or no chance of establishing a pregnancy. We, therefore, prefer to let the embryos grow for at least another 2 days to make sure that we only end up with good quality embryos in our freezer. At IVF Phoenix™, we have been doing more and more transfers on day 5-post retrieval (blastocyst transfer). Delaying the transfer an additional 2 days allows us to get a much better picture of which embryos in a cohort are really strong and healthy. By day 5, the embryo should have reached the blastocyst stage, which is characterized by the presence of a fluid-filled cavity or cyst in the embryo. Embryos that reach the blastocyst stage by day 5 have a higher chance of implanting after transfer when compared to embryos transferred on day 3. However, not all embryos that look healthy and strong on day 3 will make a blastocyst. We estimate that it takes 3-4 nice day 3 embryos to achieve a nice blastocyst on day 5. Therefore, blastocyst transfers are usually undertaken only by patients with many nice embryos on day 3. Also, patients at high risk for a multiple pregnancies and/or those wishing to transfer only one embryo often decide to do their transfer on day 5. After a day 5 transfer, surplus blastocysts can be frozen for later use. They can be frozen on day 5, or if they are developing a little more slowly, on day 6. Blastocysts have many more cells (up to 200 cells) than day 3 embryos (up to 12 cells) and we employ a different method for freezing them. All freezing techniques involve dehydrating the embryo, so the fluid-filled cavity in a blastocyst will collapse during freezing. When thawed and placed inside the incubator in the laboratory, the cavity will begin to re-expand and the blastocyst should be fully inflated about 4 hours later. Blastocysts that show little or no signs of re-expansion are unlikely to implant after transfer. The technology that allows us to grow embryos to day 5 or 6, continues to improve, and in line with this, we are offering blastocyst transfer and freezing to more patients. In particular, our ability to culture embryos in a reduced oxygen environment reduces stress on the embryos and therefore provides healthier embryos for transfer and freezing. In 2005, slightly less than 10% of our fresh and frozen embryo transfers were performed on day 5. Individuals using donor oocytes comprised almost half of the day 5 transfers, since we tend to have many embryos to choose from in these cases. Blastocyst transfer will not be an option for everybody, and not everyone will have enough blastocysts to transfer and freeze. We are freezing blastocysts almost every day now and transfers with thawed blastocysts are becoming a regular part of our laboratory routine. The first human pregnancy from an embryo that had been frozen and thawed was achieved in Australia in 1984, 6 years after the birth of the first IVF baby in the UK. Scientists employed the method of “slow freezing” to preserve the embryo, which is still the preferred method for preserving embryos throughout the world today. Slow freezing is a reliable and established technique that has served the IVF community well for over 20 years. Although the procedure has been refined throughout the years, it works—with slight modifications—for freezing embryos in all stages and for sperm. However, despite many years of trying, slow freezing has never worked very successfully with oocytes. Frustrated by years of failures, scientists turned to an alternative procedure called vitrification in their quest to preserve oocytes. If you think that you might be a candidate for a blastocyst transfer, please talk call IVF Phoenix™ for more information and to book your consultation with Dr. Couvaras.